The seventh Guru of the Sikh faith, was the son of Baba Gurditta and grandson of Guru Hargobind, Nanak VI. He was born on 16 January 1630 at Kiratpur, in present-day Ropar district of the Punjab. In 1640, he was married to Sulakkhani, daughter of Daya Ram of Anupshahr, in Bulandshahr district of Uttar Pradesh. He was gentle by nature and had a devout temperament. He was Guru Hargobind’s favourite grandchild, and he had been given the name of Har Rai by the Guru himself. Once, record old texts, Har Rai was returning home after his riding exercise. From a distance he saw Guru Hargobind sitting in the garden. He at once got off his horse to go and do him homage.In this hurry, his robe was caught in a bush and a few of the flowers were broken from their stems. This pained Har Rai’s heart. He sat down on the spot and wept bitterly. Guru Hargobind came and consoled him. He also advised him: “Wear your robe by all means, but be careful as you walk. It behoves God’s servants to be tender to all things.” There was a deeper meaning in the Guru’s words. One must live in this world, and yet be master of oneself. Guru Har Rai was at Goindval when Dara Shukoh, heir apparent to the Mughal throne, entered the Punjab fleeing in front of the army of his brother, Aurangzab, after his defeat in the battle of Samugarh on 29 May 1658 At Goindval, where he arrived in the last week of June 1658, he called on Guru Har Rai, and sought the consolation of his blessing The prince was of a liberal religious disposition, and had a natural inclination for the company of saintly persons He was especially an admirer of the famous Muslim Sufi, Mian Mir, who was known to the Sikh Gurus Sikh tradition also recalls how Dara Shikoh had once been cured of a serious malady with herbs sent to hint by Guru Har Rai in his affliction now he readily took the opportunity of having an audience with the Guru According to Sarup Das Bhalla, Mahima Prakash, Guru Har Rai deployed his own troops to delay Aurangab’s army which was pursuing Dara close at his heels.Guru Har Rai left Goindval on a tour of the districts where the Sikh faith had taken root in the time of his predecessors. He travelled further on to Kashmir. The Baisakhi of 1660 was celebrated at Sialkot in the home of Nand Lal Puri, grandfather of Haqiqat Rai, the martyr The journey was resumed in the company of Sikhs such as Makkhan Shah, the Lubana trader, and Aru Ram, father of Kirpa Ram Datt who later led to the presence of Guru Tegh Bahadur group of Kashmiri pandits driven to dire distress by State persecution Guru Har Rai arrived at Srinagar, via Martand, on 19 May 1660, and visited Mota Tanda, the village to which his disciple, Makkhan Shah belonged. On his way back, he stopped at Akhnur and Jammu. At the latter place, the local masand, Bhat Kahna, waited on him with the sangat.Dara Shukoh’s meeting with Guru Har Rai was misrepresented to Emperor Aurangzeb Highly coloured stories were carried to him. His officials and courtiers reported to him that Guru Har Rai was a rebel and that he had helped the fugitive prince, Dara. Further, that the Sikh Scripture contained verses derogatory to Islam. The Empror asked Raja Jai Singh of Amber to have Guru Har Rai brought to Delhi. 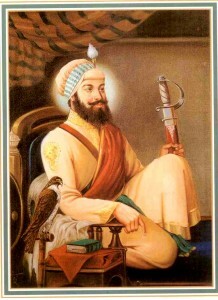 The Raja’s envoy, Hari Chand, who reached Kiratpur on the Baisakhi day of 1661, presented the royal summons. Guru Har Rai wondered why he had been called to Delhi and, to quote Bhat Santokh Singh,” Sri Gur Pratap Suraj Granth, he said, “I rule over no territory, I owe the king no tax, nor do I want anything from him. There is no connection of teacher and disciple between us, either of what avail will this meeting be?” He sent instead his elder son, Ram Rai, his minister Diwan Dargah Mall, escorting him According to the Guru kian Sakhian, Guru Har Rai blessed his young son as he seated him in the carriage and exhorted him “Answer squarely and without fear any questions the Emperor may ask. Exhibit no hesitation. Read the Granth attentively as you make halts on the way. The Guru will protect you wherever you might be.” Gurdas, of the family of Bhai Bahilo, was asked to accompany Ram Rai with a copy of the (Guru) Granth Sahib in order to please the Emperor, Ram Rai deliberately misread one of the lines from the (Guru) Granth Sahib. This was reported by the Sikhs accompanying him to Guru Har Rai, who anathematized him for altering Guru Nanak’s utterance . Debarred from presence before the Guru, Ram Rai retired to Dehra Dun. 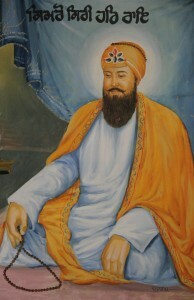 Guru Har Rai chose his younger Son, Har Krishan, to be his successor and had him anointed as Guru. Satguru Sri Guru Har Gobind Sahib Ji Maharaj, maintained an excellent garden with rare medicinal herbs planted in it. He also had a rare passion for collecting birds and animals that could be tamed and trained. Baba Har Rai Sahib Ji was having his morning stroll in the garden one day, he was reciting Waheguru with each breath he took. 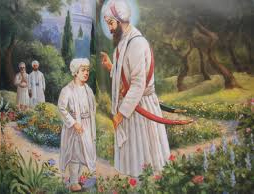 Guru Har Gobind Sahib Ji was also walking in the garden and was coming from the opposite direction to the one Baba Har Rai Sahib Ji was walking on. Seeing a beautiful flower on the ground, Guru Sahib, bent down and picked it up. “It was my fault dear grandfather” said Baba Har Rai Sahib Ji. Baba Har Rai Sahib Ji fell at the feet of his beloved Guru and grandfather and sought his forgiveness. Baba Har Rai Sahib Ji promised his grandfather, that he would in the future never show the slightest heedlessness in his responsibilities towards man, animals and plants. Restraint and self control boundless compassion and charity, were reflected in all his actions and dealings with others through Baba Har Rai Sahib Ji’s life.From that day on he would hold the long gown over his right arm. When he became Guru Har Rai Ji the Sikhs said you don’t look good holding your gown, let it go as you are the Guru now. Guru Har Rai jee said, “O Guru Nanak’s Sikhs, all of my life I’ve held it like this because it was my Guru’s Command. If I disobey my Guru by letting go of it, I’ll no longer be a Sikh. Sri Guru Har Rai Sahib Gurdwara serves the Sikh community of West Bromwich and surrounding areas and is one of the largest Gurdwara's in the region having thousands of visitors on a weekly basis. Further information about the Sikh faith and Sri Guru Har Rai Sahib Ji Gurdwara can be found on this website. For further details or for bookings please contact us. Subscribe to our newsletter in order to receive the latest news and regular updates on upcoming Programs.